Aaaaarrgh! I spent nearly the whole day doing tax return stuff. At least it’s out of the way now! I did also manage to fit in a good stress-busting plyometric workout, and taught an outdoor boxing class this evening. I’m totally covered in mud now though. Sorry for another pork recipe, but this was too good not to share. I promise my next post will be something other than pork! Wash and chunkily chop the veggies (except garlic). Put into a large roasting pan and pour on a good glug of olive oil. Stir to make sure they are all coated with oil. Season with salt and pepper and roast in the oven for 45 mins at 180C. 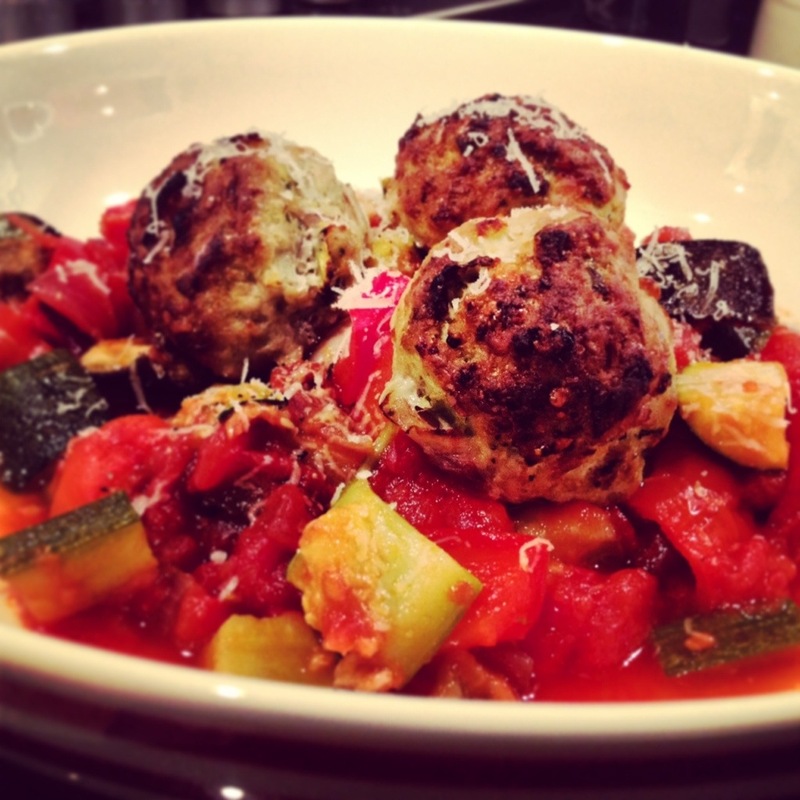 While the veggies roast, make the meatballs. When the veggies are done, crush the garlic and sauté in a little olive oil. Add the tinned tomatoes, a splash of balsamic vinegar, the basil and season with salt and pepper. Add in the roasted veggies and let them cook in the tomato for at least 15 mins. Blitz the onion, celery, garlic, Parmesan, basil and pine nuts in a food processor. Thoroughly mix the resulting goo into the pork mince and add the mustard powder, season with salt and pepper. Form into balls and bake in oven for 30 mins at 180C. Serve on a bed of ratatouille and sprinkle a little extra Parmesan on the top if you like. Posted in Meat dishes, Vegetable side dishes and tagged aubergine, basil, courgette, eggplant, gluten-free, grain-free, low carb, meat, meatballs, paleo, Parmesan, peppers, pine nuts, Pork, primal, ratatouille, roasted vegetables, tomatoes, zucchini. Bookmark the permalink. Reblogged this on cupcake went paleo..